That pivotal moment when the mentee becomes the mentor. I’ll be honest, I don’t completely understand how one becomes a good mentor. Mentorship is an essential element of the chef world. 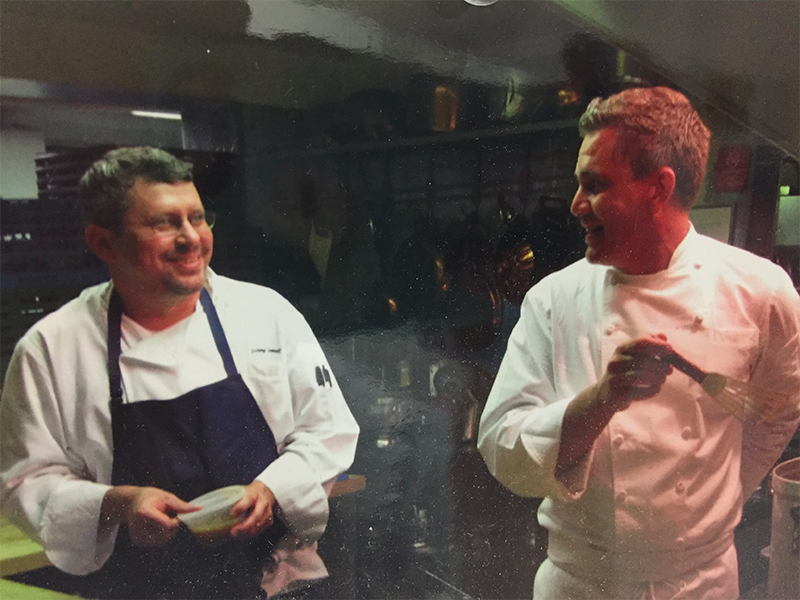 Every successful chef has had someone who was invested in them; I don’t think you can get to that level without it. It’s a big part of how we grow and develop in this field, and at some point in our careers and lives, I guarantee we’ve all needed it. I regularly call on a few key people — whose advice has been instrumental to my career in the past—when seeking validation for something, both in and out of the kitchen. One of those people is Corky Clark, an instructor at the Culinary institute of America for more than 30 years. He worked primarily in the fish kitchen, and to say that every student in the school was intimidated by Chef Clark would be an understatement. He was an imposing figure with a huge presence; a charismatic character who was never afraid to speak his mind. When I graduated, there was an opening for a fellowship position in his kitchen, helping teach the incoming classes how to butcher fish. I was 20 years old and knew nothing, but I (very nervously) went to Chef Clark, and somehow got the job. He always had very clear expectations. Show up on time, because he’d lock the door when class started and you didn’t want to be on the wrong side of it. Follow directions. Ask questions. Be prepared. Do your best, even in failure. And always want more from yourself. Sometimes the lesson was to fail—because we all need to sometime—and while being scolded for doing something stupid was a common occurrence, he was protective of me when it came to the other instructors. If I screwed up the fish order for another class (also a common occurrence) he would never let another instructor speak down to me. Rather, he would handle the lashing himself. There was always a lesson to be learned in making mistakes, which is still one of the most valuable things I learned from him. When I was 21 (still young and dumb but now adept at cutting fish) I went to work for Chef Gethin Thomas at The White Barn Inn in Maine. During my first week, I was asked to come in early one morning to show him how I cut black bass. He said my filets were nicer then his, and he wanted to see how I did it. That a chef was asking a cook how to do something blew me away. I worked for Gethin for a couple of seasons and really enjoyed how he ran his kitchen. He was good at moving people around to maximize their talents, and talking to young cooks to keep them focused. He had great empathy for his employees, which is how he was able to build a kitchen full of talented and loyal cooks eager to do a good job for him. What made Chef Gethin a great mentor, though, was the moment he pushed me out the door. I needed more experience, and he did what he thought was best for me—even going so far as to cold-call a few restaurants to help me set up interviews. Today, I run five kitchens. I’ve had a lot of young cooks come through my restaurants, and I feel a responsibility to make them better, to ensure that they gain something from their time with me—something more then just a paycheck. Since you can’t force mentorship onto anyone, I simply try to create an environment that values the people who are in it. Nicki Hobson has been in the kitchen with me since we opened Island Creek Oyster Bar almost six years ago. She started as a sous chef, and worked her way up to become our chef de cuisine, a role she’s held for the last several years. Her ability has always outweighed her confidence—teaching her about food and technique was the easy part. But getting someone to believe in their own ability can sometimes be a challenge, and early on, Nicki would often second-guess her own decisions about the menu or when working with the staff. Watching her evolution has been amazing, and it’s helped me understand that mentorship is a process and a relationship that develops over many months, and sometimes years; she’s since grown into a mentor herself, supporting other cooks in the kitchen. Yoni Levy is a great chef in San Francisco. Yoni first worked for me in Larkspur, California in the late ’90s, and then followed me to Boston to open Great Bay Restaurant. He worked for me for several years, eventually moving on to Chicago and then back to California. Last February, I was in San Francisco and got to see him again. He fed me an amazing meal and then asked to have coffee with me the next morning. He was at a crossroads in his career and wanted to talk it through. We talked about what he valued in his career and life, what was important, and whether it was better to stay in the job he had, or look for something else. At that moment, I realized: the only thing one can do to become a mentor is to simply be one. To continue to give your time, advice, and knowledge to those who want to take it. I knew Yoni would eventually make up his own mind about what he would do, but I was honored that he still wanted me to be a part of the conversation—one that we’d started more than 15 years ago. A good mentor stays invested, celebrating your successes and helping you through your failures, long after your time in a kitchen together. So, when I can’t seem to get through to a cook who needs a nudge in the right direction, Chef Gethin is the one who sits down with them. Chef Clark is still happy to let me know when I’ve screwed up, and I’ve never taken a job without getting his opinion. 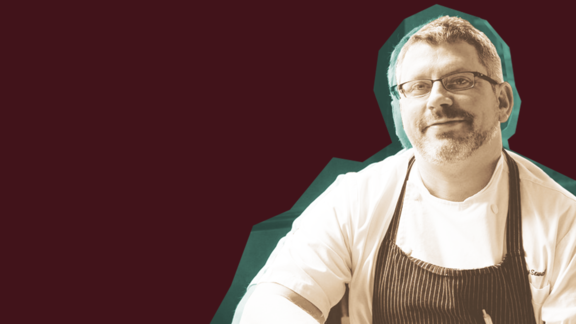 The chef behind Rustic Canyon Wine Bar, Esters Wine Shop & Bar, and Tallula's—and author of 'On Vegetables'—on mentorship and changing times. Boston's Jeremy Sewall journeys to Seattle.